So what does any of this have to do with Spock? When the hands are raised to give the blessing they are configured so that the two hands, palm downwards, touch at the tip of the thumbs or the thumb joint. The thumbs are spread apart from the index fingers, and on each hand the index finger and middle finger are held together (or sometimes barely separated from each other) and separated from the ring and little fingers, which are likewise held together (or barely separated from each other). The result? 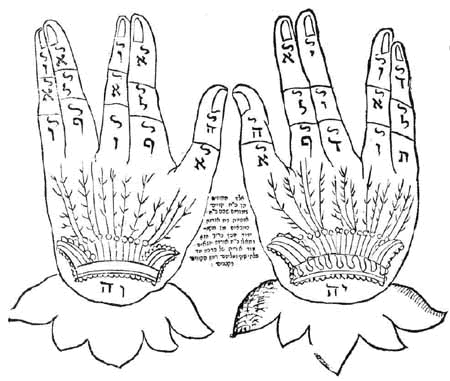 The hands have five openings or apertures, look like the Hebrew letter shin (which some interpret as a reference to "Shaddai" or "Shalom"), and have the appearance of a double-handed Vulcan salute. 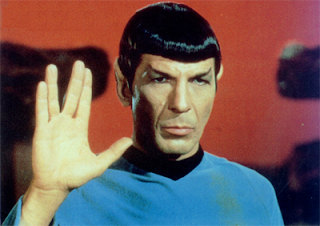 Leonard Nimoy has written that he witnessed his father make this hand gesture as a child, and that it was his inspiration when he created the Vulcan salute. Of course he modified it a bit, by having the palm face outward instead of downward and using a single hand rather than both hands. The "live long and prosper" is also a bit different than the priestly blessing. Rabbi Yonassan Gershom, author of Jewish Themes in Star Trek, talks a bit more about the Vulcan connection here. Arthur Kurzweil also notes the connection in The Torah for Dummies. 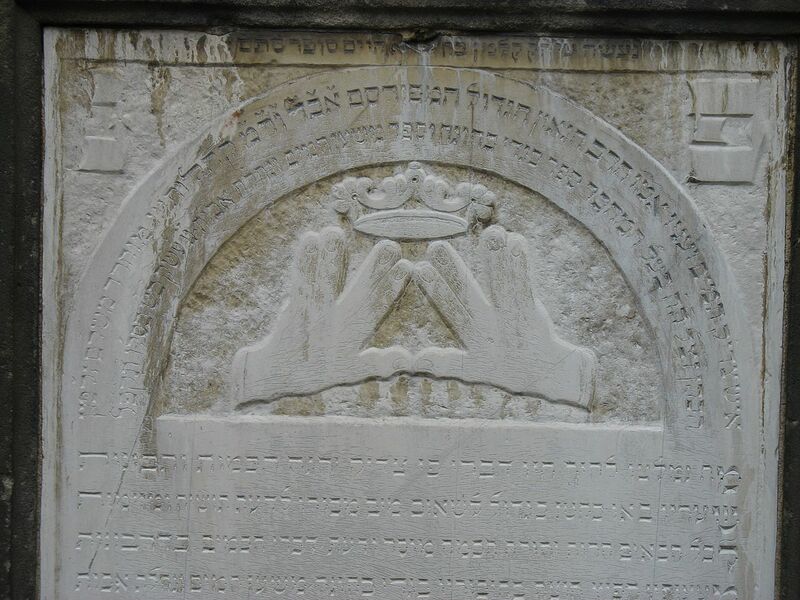 The Midrash (read it here or here) interprets God as the beloved standing behind the synagogue walls, looking over the shoulder of the priest giving the blessing ("gazing through the windows") and looking through the gaps between the priest's fingers ("looking through the lattice"). The five gaps or apertures between the fingers has been associated with an interesting reading of the Hebrew word for "lattice" in Song of Songs 2:9. The word is hacharakim. The "ha" at the beginning is the Hebrew definite article ("the"), which is prefixed to Hebrew nouns. If it stands by itself and is not prefixed to another word that Hebrew letter is the numeral 5 (it is the fifth letter of the alphabet). So some have separated it in this verse, making it read "five openings" rather than just "the openings" or "the lattice." Personally, I find it pretty fascinating that we have a 20th century TV show that portrays people in the 23rd century performing a hand gesture that is based on a similar hand gesture that seems to go back at least to the medieval period and is ultimately connected to a ritual performed in ancient Israel. 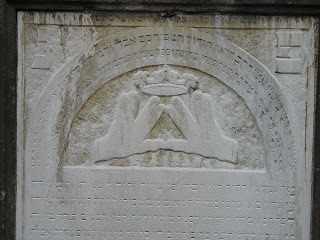 Early 19th century headstone of Meschullam Kohn.